Q. What should I bring when I come for my sled dog adventure? A. Most importantly, bring warm clothes. Even on a warm day it can be cold on the trails where we give tours. A warm cap, mittens, winter boots, snow pants, long underwear, and a winter parka with a hood are all recommended. You can always shed clothing if you get too warm, but being cold can ruin a wonderful experience. Other than that you might want to bring a camera and an attitude of fun, fun, fun. Q. Can we pet the dogs? A. Most certainly. All of our dogs are friendly and well socialized, and they love to be petted. 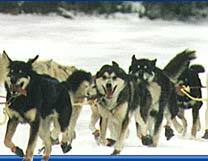 Be sure to ask your musher though before approaching the dogs, so he can monitor the situation at all times. Q. Do I get to drive my own sled? A. Yes. We almost always pull two sleds behind one dog team. 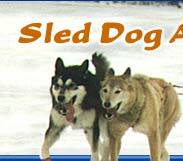 An experienced musher will drive the front sled and you and your friends can take turns driving the second sled. Fun, Fun, Fun! Q. Do the dogs really like to do this? A. Yes they do, but you don't have to take my word on it, come and see for yourself. When the dogs are hooked up and ready to go, they make their excitement for running very obvious. Q. Have you ever run the Iditarod? A. No. 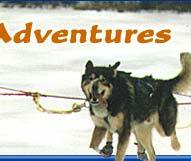 If you would like to sponsor me with about $50,000, I would love to run the Iditarod. It's every mushers dream to run the Iditarod. Click here to see a list of races entered by Suomi Hills Kennel. Q. What do you do with your dogs when they are too old to run? A. When my dogs retire they generally become pets. 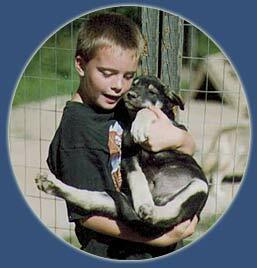 If you would like to apply to adopt a retired sled dog, see the previous page on this website. Q. How old do your dogs have to be to be able to run? A. I generally take my dogs for their first run at about four months of age. This is to start getting them used to being a sled dog. It always amazes me how quickly they take to it. They are usually at least a year old before they start to give tours with the big dogs. Q. When are your dogs too old to run? A. It varies from dog to dog, but most dogs can run until they are ten years of age and often times longer. All of my dogs are very healthy dogs. They eat the best dog food available, get lots of exercise, and generally live a wonderful and happy life. Q. What do your dogs eat? A. My dogs eat mostly raw meat with a vitamin/mineral supplement and water mixed in. Sometimes they also get a little extra fat. Q. 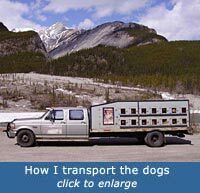 How do you transport your dogs? A. I transport my dogs in my dogtruck. It is kind of like an apartment house for dogs on wheels. Each dog has it's own compartment with straw bedding and a window for ample fresh air. Q. What do your dogs do in the summer? A. Summers in Minnesota are often too hot to run the dogs safely, so they get a little R&R. As soon as the temperature start cooling down in the fall, the dogs pull a 4-wheeler to start getting in shape for the snow. Q. Do your dogs ever fight? A. I teach my dogs right from the start that fighting is not allowed, and they respect me enough to be really good at following my rules.